THat ZH is doing wonderful ornaments! We don't think you should get as big and MudMan! You are just right just like you are! MudMan was really big!! The Zoolatry Human does fantastic work! Whoa! The Mudman was a big boy!! We love his ornament! The Mud Man was a big boy, wasn't he. RIP Mud Man, we're sorry we never got to know you! Muddy was such a wonderful mancat. Zoolatry did a wonderful job on his ornament! She did one for our Cal too! Wow! How big was he? Zoolatry does wonderful work. Hey there! 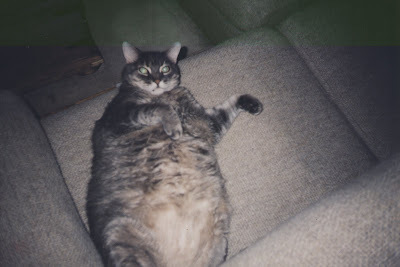 Wow, Muddy was a BIG mancat. Both of you together aren't as big as Muddy was. That is a lovely ornament that ZH did for Mudman. He certainly was a big boy. 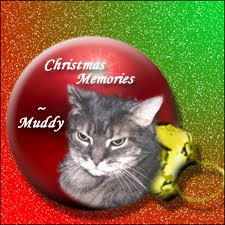 That's a great remembrance ornament Zoolatry made for you...Muddy was a big man for sure! Wow - he was even bigger than our brother, Tigger, was! (who went to the bridge in 2005). Cute pics! MudMan looks kind of like our Tommy...size-wise that is. Have a great holiday! Samson, you are just tooooooo cute!!!!!! You do us mancats proud!!!! Wow!!! Mudman was a real big fella!! He would have been fun to snuggle with!! Muddy was furry BIG! He was also furry cute but of course no one can compete with your handsomeness Samson! We love your reaction and we certainly hope you get more treats you skinny Mancat you! Muddy was a handsome guy! And MOL, MOL, MOL at your face when you saw him!!! That is a wonderful tribute to Muddy that Zoolatry made. He really was a big guy! We know you are glad to be number 1 Samson, but we do wish we could have met him if even for a little while. But we are glad to know you at least (and Delilah too of course)! This is so nice, I'm sure your Mommy was pleased to get this wonderful ornament. I have to say I love your expression, I think, you look speechless, choke! Oh wow--Muddy was 'big boned'--just like my Uncle MaxMaxx--maybe more big--I think I woulda stayed out of HIS way! Wow! Muddy was a big (but cute) dude. 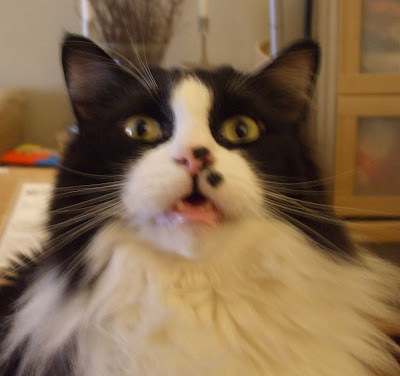 We made the same face as you when we saw his picture, Samson! let's all get some spare treats! Muddy's ornament is lovely! That Mudman was a big Man-cat! Ok, he was huge! I think I'd like him. Maybe he's hanging out at the bridge with my Jonathan.